It's Coke vs Pepsi in FIFA 17! Liverpool vs Everton, Rangers vs Celtic, Atletico vs Real: one of the best things about FIFA 17 is being able to play out the biggest derbies in world football without having to trouble oneself with policing costs, or worry about changing the kick-off time to 9.45 on a Sunday morning for safety reasons. You can now add Coca Cola vs Pepsi to that fabled list. Thanks to the majesty of Ultimate Team – and, specifically, its ability to swap kits around in your clubs at will – these two behemoths of the soft drinks trade can be thrown together to decide who really is king of the fizz-ball pitch. It’s the title both have always wanted. Just neither of them knew it until now. The Coke kit was harder to come by. It’s part of a deal between Coca Cola, EA and 7-Eleven in the US. 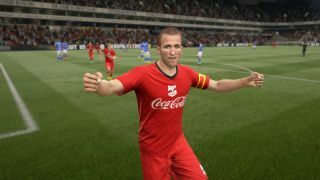 Any ‘Big Gulp’ cup purchased from the latter contains a code that nets the buyer FIFA 17 prizes such as a copy of the game, jumbo gold pack, or – yes – the red-and-white kit seen here. Except after dispatching a Stateside member of GR+ to his local store on multiple occasions to drink his own weight in Big Gulps (thanks/sorry Connor), I’d earned a shedload of new cards, but still no Coke kit. And so was reduced to mailing EA Canada’s press office to ask for a download code in order to write this feature. Thankfully, it was able to provide one. The Coke kit’s an untradeable item, so can’t be found on the in-game transfer market. All four Pepsi kits can be sourced relatively easily, for 150 coins. The most saccharine of starts for in-form QPR midfielder Chery, as he spins Mountain Dewaest – who’s perhaps distracted by the complimentary Doritos being handed out in the stands – and finishes low into the bottom right corner. Pepsi keeper Butelle topples over to no avail. First blood – hopefully free of type 2 diabetes – to the red team. Dr Pepper – yes, I can get away with him being on the Coke team despite being a different company, because the latter distributes that drink in the UK. Also this is supposed to be a bit of fun – starts the move which doubles the reds' lead. His drilled pass finds Giles Coke, who slips the ball in for Powerade to dink over Butelle. Fittingly, the goalscorer takes a spill in the process. A lifeline for the boys in blue. Siguira gains possession in the centre of park, springs Pepsi Max Gradel down the left flank, and the Bournemouth winger’s cross is slammed into the roof of the net by Tincan. Bitter aftertastes overwhelm the Coke squad’s back four. Which isn’t unexpected when you have Fanta-limon between the sticks. Another sugar crash for Mountain Dewaest. The low-carb, high-energy figure of Zero-ual cuts in from the right flank, flings a hopeful pot-shot (or should that be pop-shot?) towards goal, and the Genk defender can’t help but stick his knee out – diverting past Butelle in the process. Not even half-time, and we already have four goals in this one. Sweet. Both sides are starting to slump now. Pepsi skipper Koke swings a corner in from the flank, which a tired Dr Pepper can only nod skywards – and Powerade fails to jump for the second ball. An unchallenged Kolarov loops a hopeful header towards goal, both Fanta-limon and Coker make a mess of the clearance, and it drops into the net to put Pepsi back in with a shout. After a quiet first half, Sugar Kane finally plants the roots of victory. The influential Giles Coke – still so energised he’s clearly been supping on full-fat, rather than that backwash-flavoured Life nonsense – slides a pass between two defenders, and Harry lashes a first-time shot into the top left. Truly, a sparkling finish. Both sets of players are knackered from running around for an hour and half. I’m exhausted from pouring out fizzy drinks gags. So naturally, the AI brings on the pun-resistant Riyad Mahrez in a sorry attempt to sabotage this groundbreaking and critical piece of investigative journalism. Sure enough, the Leicester maestro spoons one in off his backside – no, really – after getting in the way of fellow sub Kaka’s shot, and the Pepsi lads have five minutes to find an equaliser. There are no last minute dramatics. The Coke back four mops up Pepsi’s remaining sprays upfield, and the latter’s thirst wanes. On 94 minutes, it’s over. Coke are the champions. Their squad earns bragging rights, a 1.75 litre bottle of the amazing-but-long-discontinued vanilla-cherry variant, and free Pizza Hut refills for 30 days. Pepsi’s lads each take home a crate of Freeway Cola from official studs sponsor Lidl. Hey, at least it’s not the diet version. Next week: KFC vs McDonalds. Because who doesn’t want to see Matt Fillets face off against Dael Fry? Oh. Looking for some more serious Ultimate Team coverage? Then be sure to check out GR+'s list of FUT tips garnered directly from developer EA Canada.